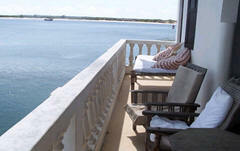 Th e Lamu Palace Hotel is located in the center of Lamu right at the sea. The Hotel has three floors; the ground floor contains a restaurant, a Pizzeria and a Bar, the first and second floor holds the hotels' rooms while the third floor has a Parlor and a beautiful terrace equipped with sun beds crowns the hotel. the hotel has a total of 22 rooms. All the rooms are well ventilated with air conditioning and fans. Four of them are superior rooms with sea view and one is a suite. the hotel offers a restaurant which is set on an external veranda with sea view, serving Italian, Swahili and international cuisine. the hotel has a bar, which is one of few places that is licensed to sell spirits in Lamu. Happy hour is every day between 6PM and 7PM with a 30% discount on all drinks. The reception has a fridge which serves as a bar when the normal bar is closed. This beautiful and historic inn is the oldest accommodation place on Lamu Island. Lined on the waterfront near the museum, Petley's Inn is furnished in authentic Lamu style with a blend of African and Arabic. 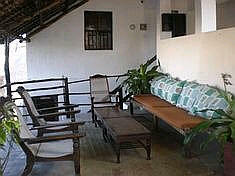 The hotel building is a typical 19th century colonial building with balconies and a palm-thatched roof. Ornately carved wood, fascinating artifacts, verandas and terrace come together to create a restful and stylish ambience. It has eleven rooms equipped with air-condition. It offers an open air penthouse, a swimming pool and a popular roof-top bar. Petley’s is based on bed and breakfast (BB). If you come on half board (HB) or full board (FB), you will have to use the main restaurant at the Lamu Palace which is 400m from Petley’s. 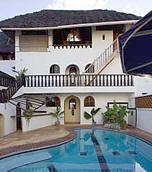 Chale Paradise Island hotel is located 55 kilometres from the Lamu Airport, it boasts of 55 guest rooms with fans. The hotel has 2 restaurants, one international and one Japanese. Further amenities include a bar, swimming pool, volley ball, billiards, a boutique, beauty parlour and watersports. The Majlis resort is a privately owned luxury beach hotel on Manda Island in the Lamu archipelago off Kenya’s Northern Coast. With a superb beachfront location and breathtaking views over the Ras Kitau bay and Shela village. The Majlis it offers the perfect setting and the ideal location for barefoot luxury, informal pampering and excellent cuisine. The Majlis, a boutique hotel offers 25 exquisite deluxe rooms and suites divided into 3 beachfront villas. The rooms, all presented in timelessly elegant Lamu style. 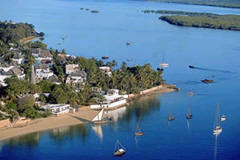 Kijani Hotel is located in he village of Shela, on the island of Lamu – just off the Kenya Coast i n a 3,000 sq. metres of tropical garden with two fresh water swimming pools.Kijani Hotel Lamu has 10 rooms spread throughout the garden into three small separate traditional Swahili buildings which formerly were private homes. Kijani’s rooms and gardens are filled with antiques or handmade replicas of the furniture, lanterns, ornaments, and utensils that graced the stately houses of Lamu’s past. Copies of Old Portuguese lanterns hang from white archways. An arrangement of ceramic water pots stand – used to carry oil and water aboard ships centuries ago – stand under the shade of a palm tree. Kizingo Hotel is situated at one end of a spectacular 12-kilometre beach that stretches from Kizingo (which means 'the point’ in Swahili) to the fashionable village of Shela in Lamu. Kizingo has eight beautifully appointed bandas (thatched cottages), set well apart from each other. 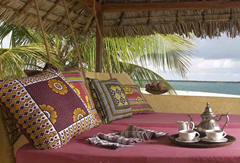 In the early morning you can enjoy tea in bed and watch fishing dhows tack south to Malindi. 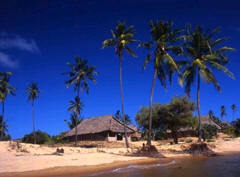 Peponi Hotel offers Lamu beach holiday accommodation in 24 superior and standard rooms. No two are alike and superior rooms are differentiated by their location, size and decor. Five of the rooms are built right on the beach, with private verandas overlooking the sea, while the rest have a combination of ocean and garden views. All the rooms have mosquito nets and overhead fans and are decorated with indoor plants, artwork and Swahili furnishings. Kiwayu Safari Village is near Lamu on the Kenya coast and has eighteen private beach bandas positioned along a private stretch of beach, each decorated in the traditional Swahili style of palm thatch and woven matting floors. 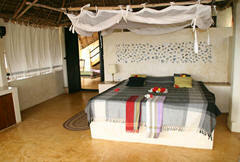 Each banda at Kiwayu Beach Lodge comprises of a spacious bedroom with a dressing area, twin basins and a shower. To the front, each banda has a private veranda where you can gaze out over the bay from the comfort of your hammock. Baytil Ajaib (The House of Wonder) has been painstakingly renovated over the last 8 years by affable owner, Paul Weaver, who has divided the original Swahili town house into a series of suites and double rooms whilst managing to lose none of its original splendour. Baytil Ajaib offers 2 double apartments and 2 double suites. All apartments and suites have their own private bathrooms. There are also scattered seating arrangements in Baytil Ajaib for those that may want to curl up and read in some other part of the house. Jannat House located in Lamu is a small hotel is steeped in history, having been owned by the famous Muawiya family, descendant from the uncle of the Prophet Muhammed. Jannat House has 16 bedrooms mainly doubles and a total of 35 beds altogether, original Swahili style with typical furniture, 5 terraces some with sea view, swimming pool, good JAVA coffee, bar and restaurant. Jannat is a hotel that offers you the ultimate experience of relaxation, adventure and exotic Swahili lifestyle. It is a perfect place for professional and personal retreat. 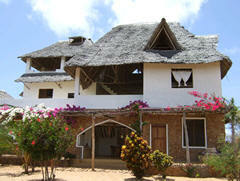 Shela Bahari Guest House is one of few ocean front guest houses on Lamu Island. Within a few minutes of walking the famous twelve kilometre unspoilt beach lies waiting for you. The Shella Bahari Guest House boasts of five bedrooms,all ensuite,decorated with quaint little pieces of Swahili furniture. Each rooms is equipped with ceiling fans and bed nets. Banana House and Banana Wellness and Yoga Centre in Shela Village, Lamu, comprises two private houses which have evolved into a friendly 'Bed & Breakfast' alternative in Shela. 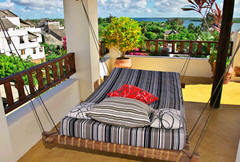 Msafini Guest House (hotel) located in shela village oin Lamu has a total of 14 self – contained rooms. The ground flr has reception, swimming pool, main kitchen and a public restaurant. Rooms at the Msafini Guest House (hotel) are equipped with overhead fan, mosquito net and private balcony. The fourth floor has one room and a huge open terrace which serve as a “resident only” restaurant. 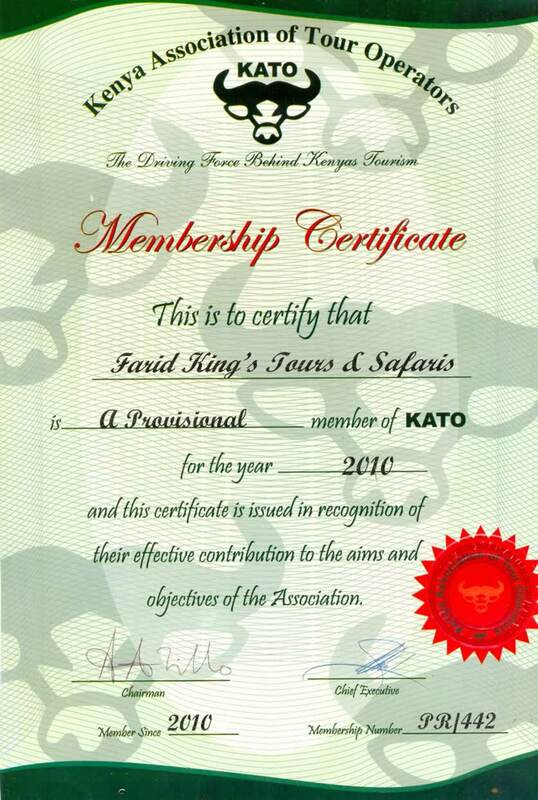 If you want to experience the best of Swahili lifestyle, this is the place to be. 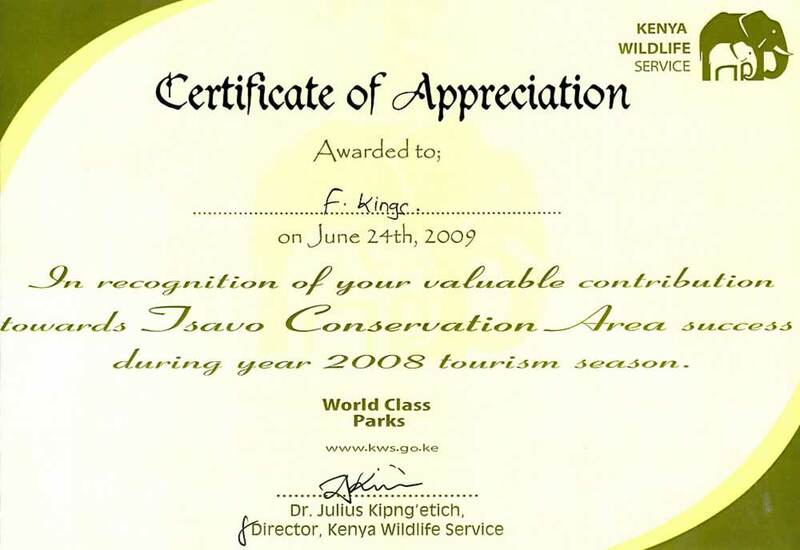 Kipungani Explorer – Kipungani Bay, Lamu Island is managed by the Heritage group of hotels and overlooks a deserted 14-kilometre beach on the South-western tip of Lamu Island. Kipungani Explorer is a dream destination for those seeking a true desert island holiday, in a secluded location. 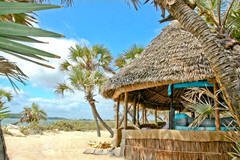 Kipungani Explorer in Kipungani bay Lamu island has 14 chalets which are well secluded and shaded by palm trees. Chalets are constructed entirely from local materials, with grass floors and thatch roofs woven by the neighbouring villagers. The large interiors are a picture of rustic simplicity, with giant king-size beds and furniture all hand-made from local woods. Fatuma's Tower and Yoga House is a three stories building built of thick coral walls with high ceilings located in the sleepy fishing village of Shella on the island of Lamu. Fatuma's Tower was last occupied a hundred years ago by a Swahili noble woman named Fatuma Abu Bakar who lived in this sanctuary attended by five female slaves until the end of the 19th century. Fatuma’s Tower has four double rooms with washrooms (and hot water) and two singles sharing a washroom. 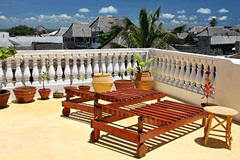 All rooms are furnished in the traditional Swahili. Bed linen, mosquito nets, house towels and fans are provided and there is a safe for valuables. 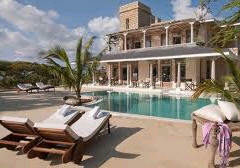 Mkoko house is built on nearly one acre of land set 5 minutes walk from Manda beach on Lamu island. Mkoko House is situated on the edge of the mangroves in a quiet and peaceful setting on Manda Island. Mkoko House offers accommodation in three en-suite double bedrooms with mosquito nets draped over the beds and fixed on to the shutters to keep the mosquitoes and other annoyances at bay. Jambo House is a small guesthouse with only 5 rooms: (2) self-contained, (2) with outside bathroom/toilet (private/not shared) and (1) with integrated shower but outside toilet (private/not shared). Breakfast is served on the rooftop terrace with a good view of Lamu Town. There are also sun beds available to relax. Part of the house is connected to solar power. Jambo House is ideally located in the historical Old Quarter of Lamu Town which is UNESCO World Heritage Site since the year 2001.